The unit of tackles Joe Staley and Anthony Davis, guards Mike Iupati and Alex Boone and center Jonathan Goodwin had started every game and was the foundation to the team’s success on offense. In re-signing Davis to a five-year extension, first reported by ESPN Friday, the Niners are acknowledging that they want to keep this group together for as long as possible. Davis, according to the report, is guaranteed $17 million in the new contract that could be worth a total of more than $37 million. This past season, Davis, Boone and Goodwin were selected as alternates to the Pro Bowl, while Staley and Iupati were elected Pro Bowl starters. Davis, a first-round pick in 2010, has started all 48 regular-season games since coming into the league, plus every postseason game. The 49ers now have locked up both tackles long-term. Staley is signed through 2017. Iupati is signed through 2014 and Boone through 2015. The only member of the fivesome without a multi-year deal is Goodwin, signed through 2013. After this season, Goodwin could be retained, or could be replaced by Joe Looney, a 2012 pick from Wake Forest. Boone joined the group as a starter in 2012 and was an instant success. From Game 1, the 49ers line consistently overpowered opponents in the running game and protected Alex Smith and then Colin Kaepernick at quarterback. Having all five together for every game of the season was invaluable, said offensive coordinator Greg Roman. Staley, Davis, Iupati and Boone have the potential to play together for a long time. Staley, the elder statesman, was a first-round pick in 2007 and is just 28. Davis, taken in 2010, is only 23. Iupati, also a first-round pick in 2010, is 25. Boone, 25, was an undrafted free agent from Ohio State signed in 2009. At 34, Goodwin remains a rock in the center of the line and is a former Pro Bowler who’s played on two Super Bowl teams, but may have only one season remaining in San Francisco if the Niners believe Looney – a 22-year-old taken in the fourth round in 2012 -- is ready to step in. 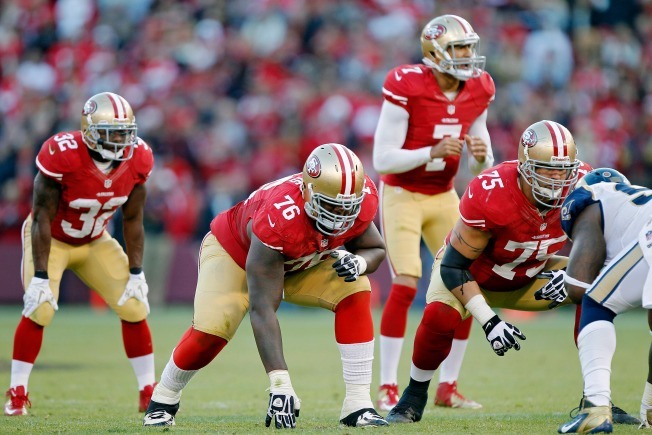 And, based on the 49ers’ commitment to Davis, a group that may be together for a long time.